A salaried worker insured with IKA or another eligible insurance fund is entitled to collect unemployment payments from OAED (Organismos Apascholiseos Ergatikou Dynamikou) for a maximum of one (1) year if fired, laid off or otherwise terminated from a job after two consecutive years employment. Working illegally or as an independent or self-employed consultant/contractor/freelancer with OAEE (TEBE) does not qualify a worker for unemployment benefits, although the labor minister discussed the possibility of extending them to freelancers in April 2012. Monthly payments commence after a 30- to 60-day waiting period and are determined on the total length of employment and social insurance contributions (ensima). A half payment is given at Easter and summer and a full payment at Christmas, much like a normal salary. The monthly rate was reduced 22 percent to 359.97 euros on March 12, 2012. * Article last updated December 26, 2013. There are three revisions pending for this article, with new info for 2014.
Who can collect unemployment payments? Non-EU citizens with a valid residence/work permit sticker or card: If your permit sticker/card expires and is not renewed during the year you are eligible to collect, unemployment payments will be cut off. No exceptions. * Seasonal workers, such as those in tourism, must have 100 days in the last 12 months; other professions need 120 days in the last 14 months. — Up to age 49: To collect for a full year, you must have 250 ensima in the last 14 months. — Aged 49 and over: To collect for a full year, you must have 210 ensima in the last 14 months. An unemployment claim must be filed at OAED within 60 days of date of dismissal. My recommendation is to start as soon as possible since some employers provide the wrong or insufficient papers, and the former employee is responsible for gathering them. No mercy will be shown if time runs out. Seasonal employees need to submit papers from October 1 to November 30. Failure to file during the specified period may result in loss of benefits for the year. b) Any KEP Citizen Service Centre. The basic unemployment benefit rate is 359.97 euros/month as of March 12, 2012, with 10 percent added for each eligible dependent. It lasts between five to 12 months, depending on length of employment. 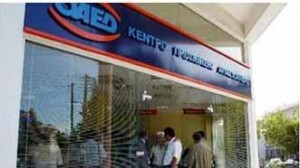 Austerity measures from February 2012 reduced private sector salaries by 22 percent but excluded OAED. Eurogroup negotiations on March 1 determined more cuts were necessary to qualify for the next bailout tranche, and a 22 percent reduction would indeed apply to jobless benefits of 461.50 euros/month, set by a collective agreement on July 1, 2011. In 2010, it was 454.25 euros/month. Persons getting unemployment benefits are expected to have or open a bank account at the National Bank of Greece (Ethnikis Trapeza tis Ellados) to receive direct-deposited payments each month. The benefit is paid as long as the claimant continues to appear in person at scheduled intervals and meet eligibility. If the claimant does not appear at scheduled intervals, OAED can discontinue benefits. In the past, everyone was issued unemployment checks that needed be stamped each month by several OAED staff — after the specified date each month and before the expiration date — then cashed at a designated National Bank of Greece branch nearby. Consult OAED to enroll or find out more information on work and integration programs at: www.ypakp.gr. However, take note that most employers do not participate in these programs because of burdensome bureaucracy and the state’s tendency to delay payments, which is why most companies lay off employees. There are also cases where the employer fires employees after getting the money. Companies and businesses announced discounts for the unemployed, including PepsiCo (Ivi, Tasty Foods), AB Vassilopoulos, Wind Telephony, Everest, La Pasteria, Olympus Plaza Food Parks, Kotsovolos, Goody’s, Nikas (at Sklavenitis only), Flocafe and Papadopoulos. NEL Lines also offers a 50 percent discount on ferry tickets as of February 1, 2012. Note that beneficiaries must have an OAED card and some restrictions apply. Persons unemployed up to three (3) years may extended health insurance coverage by producing 50 ensima (stamps) — instead of 80 — in the past 50 days or anytime in 2011. This measure has been in effect since 2011 and has been extended to March 1, 2013. Greece may implement changes to the unemployment system by 2012 that will take into account a household’s total assets and income before claims are approved, thus disqualifying anyone with property, annual earnings of 6,000 euros or financial support from other sources (spouse, family, etc.). However, the minister now in charge since the recent cabinet reshuffle appears to have backed away from this change. The system in place now allows anyone meeting eligibility to collect unemployment payments in Greece, regardless of how rich they are. Thank you for your post, I never knew there was a 30-day waiting period. I filed my papers 31st July 2009 and they told me to come back on the 16tH September 2009 for what could potentially be my first paycheck. I was wondering why in my case, takes longer than a month. Could it be because of August, when pretty much everything is going into slow mode? Also, could you please let me know if there is a chance that I will not receive the unemployment benefit at all, when I go on the 16th? The woman said something about it having to be approved first…Thanks in advance. Public sector offices work with a skeletal staff during summer, so coming back in September is for your benefit. It’s not because your case specifically is taking longer; it affects the majority and depends on the location, staff, etc. All claims must be approved like any bureaucratic process in Greece; unemployment benefits in Greece are not automatic. However, if you’re approved, payments will be retroactive. Different people give you different answers either because they don’t know the right answer, or you’re not giving them enough information. Tourism workers do have a special status and qualify for certain benefits. My advice is to take all of your documentation and go straight to OAED to speak to someone; they may ask you for a certified printout of your ensima from IKA, so it’s up to you if you want to get that before or after going to OAED. Addresses are provided in the link under ‘Related posts’ in the article above. I have been working for a tourist company here in Athens for the past 5 years as a seasonal worker. Last year I worked April-October, this year May-October. Submitted my paperwork and was told to collect my check 11/12. Went and was given a printout paper saying I was rejected. Every time I go there is a different answer from the staff. What papers do I need and how do I proceed? Eligibility to collect unemployment depends on several factors. There is an article on this subject, but I will not make it available again because other websites have plagiarized it and broke my rules. More importantly, I cannot advise you because I am unfamiliar with your case and do not work for OAED. It’s frustrating to get a different answer from different people, but you know that’s a side effect of having a ‘flexible’ or ‘free’ system where rules are bent and public sector workers are not accountable. If you are displeased with how you’re being treated and want a result, you can file a complaint with the Greek Ombudsman. It’s very easy to file, and he does get results. See “Greek Ombudsman” for contact details. Thanks for your previous reply. I did get my first “paycheque” from OAED; I am entitled to it for 8 months. I was able to withdraw money from the bank somewhere on the 20th September but on my paper with the table of impending payments it clearly states that payments are to be paid on the 30th of (each) month. However, thinking that I was able to withdraw money last month before the 30th, I went to the bank to see if I can withdraw anything but there was no new balance. Does it have anything to do with my renewing my OAED card first (which is due on the 30th as well?) On the table of the payments it is stated that the first day of payment for this month starts is 30th September and the last 29th November. I am confused. I thought that the benefit was given every month but there is clearly a two-month gap in this “deadline”. How do I know when the money will be added in my account without popping into the bank every couple of days? Many thanks for your patience in reading this! There’s no way that I or anyone can accurately answer your question without reviewing all of your documents. — If your OAED payments say that they’re due for deposit on the 30th, you should never expect them to arrive early. If by some luck one payment does arrive early, be grateful but don’t expect it to happen every month. This is Greece. Further, if you follow Greek news, the Greek economy is in a state of emergency and OAED is having funding problems. — Payment checks or deposits have two dates on them — the first is the earliest date it can be deposited; the second is the latest date it can be deposited, usually 60 days later (meaning, there is an expiration date or deadline). — If your bank doesn’t provide online or telephone banking, the only way you can check your balance is to go in person. — If you don’t have a valid OAED card, your payments will stop. — If you’re a non-EU citizen and don’t have a valid residence/work permit, your payments will stop. Since your payment/deposit isn’t due until the 30th, it’s not late and there is no issue to resolve. Instead of posting questions in forums of questionable credibility (which I know you’ve done), or asking a stranger to conjecture about a problem that currently doesn’t exist with incomplete information, why not at least wait until after the 30th? You can also use the OAED contact info I’ve provided above in English and take control of your life by inquiring directly with people most familiar with your case. Thank you very much for your time and answer. I am a Greek citizen therefore there is no residence permit issue. I can just wait until the 30th October if it all comes down to it but as you can understand, bills and expenses wait for nobody and waiting for another 10, maybe more, days is really not convenient for me right now. Hence the urgency of my question, which must have inevitably sounded the lazy girl’s way of figuring it all out. I must be honest and say that your last paragraph disappointed me. “Instead of posting questions in forums of questionable credibility (which I know you’ve done), or asking a stranger to conjecture about a problem that doesn’t exist with incomplete information”: I thought the purpose of this site is to answer people’s questions in a non-critical way; had I found reliable information even in “forums of questionable quality”, I would not have come here asking for your insight (which I obviously trust, with you having lived and worked in Greece for so long). I realize that my problem practically might not exist, but it is still an issue that I need to figure out. Thank you very much for taking the time to help me figure it out. God bless. I never suggested you were lazy or criticized you. But if you’re a Greek citizen, then you should know better than I do that the Greek government and OAED do not care if you have bills that can’t wait until the 30th; they figure you’ll seek employment, withdraw funds from your savings account or get a loan from a friend/relative if you need money. We all have our own challenges and concerns. If you’re disappointed with the assistance I provide for free and the straightforward approach in which I dispense it, please allow me to reserve time and energy for myself or invest it in people who are not. Thank you, and all the best. I have just submitted all my papers to Oaed (10 Nov), and have been told to return to sign for my first payment on 22 January ! Luckily I have enough money to support myself until then, but I think this is a long time to wait. I would have to assume that if I had a family to support or if I pleaded poverty they would have to supply me with funds before this date, (or I would hope so). There has always been a waiting period before unemployment payments start; in other countries, this is also the case. Also note that OAED is broke and is getting cash injections from the state to sustain itself. Can I still collect unemployment benefits if I am abroad? It depends. You did not provide enough information for me to help you. Therefore, I recommend contacting OAED. There are a lot of rumours going around that all seasonal workers are entitled to an extra payment this winter (on top of the Christmas bonus). Have you heard anything about this ? I tried asking at OAED on the island I live on. But they are still busy with signing on the unemployed and are so rude and unhelpful, that even after queueing for 2 hours to see someone they tell you to come back after Christmas when they are not so busy. I’m not sure if the extra benefit would just be for people with children. Any info would be greatly appreciated..
Don’t believe the rumors, especially since OAED, IKA and OAEE/TEVE are all bankrupt. There are no extra doros on top of the doro already being paid. Several social solidarity subsidies are available to those with low income (pensioners and salaried workers), long-term unemployed and people with children. There are very strict income ceilings and ensima requirements, and everything must be documented and certified. To determine if you qualify, visit the nearest KEP office and inquire. Please be so kind to inform me when the IKA insurance entitlements for Easter date is for employed persons. Thank you. Hello, I just have few questions. I want to go to O.A.E.D. to make unemployment card. Maybe you know what documents I need to bring them? Should I better go with a Greek friend because my Greek isn’t perfect? How long it takes to get that card? Thank you very much. The article detailing what documents needed to file an unemployment claim at OAED is currently password protected due to abuse. You should definitely bring a Greek friend if you cannot manage; even if staff speak English, it’s helpful to have someone verify that your personal info is correct on all forms (in Greek, of course). The card is issued immediately if you qualify and provide the required documentation. If i move to greece from the uk to find work, do i register as unemployed when i get there? As and when i find a job can i claim unemployment benefit until that point? It’s best to consult someone who has more knowledge on unemployment claims as their pertain specifically to UK citizens and coordinating between the UK and Greece. See, “Unemployment” from Living in Crete, written by a UK citizen with expertise on living in Greece. hi i work in greece on a political stay card, and i work round about 13 months and i have proof for this but it’s my first time. now i am fired and don’t have work, so could you please tell me if i am able to apply for unemployment payments or not. i have 2 months work then 6 months no job and again got a regular job for one year or 13 months, and now again no job, so how much is needed to apply for unemployment payment in my situation? I’m unable to give you a yes or no answer because it is necessary to calculate how many days you worked in the past two years, and also the last 14 months. It’s my opinion that you do not qualify for unemployment benefits based on the information you provided, but I recommend you consult an OAED office nearest your residence to get an official answer.